Stags boss David Flitcroft knows Cambridge cannot be taken lightly. 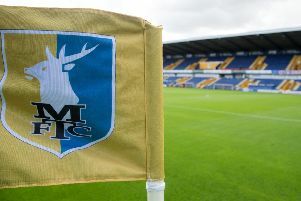 Mansfield Town boss David Flitcroft praised the honesty of Cambridge United and warned of the dangers they pose ahead of Saturday’s massive home clash. Although still in a battle for survival they won 3-0 at promotion hopefuls Bury on Tuesday and Flitcroft said: “I have spent a lot of time in Leagues Two and One as a player and a manager and I respect those divisions massively as they are full of honesty. “That’s why you get results like the other night. Cambridge are fighting for their football survival and they needed the three points. “They showed the galvanised spirit I expect from League One and League Two clubs. “They are not lads with loads of money in the bank. They are fighting tooth and nail for their own individual futures as well as the football club. “They are not lucky enough to be getting five year deals on phenomenal money. He also had praise for ex-Stags player Colin Calderwood, now in charge at Cambridge. “They have a top manager in Colin Calderwood,” said Flitcroft. “He’s worked with some top players, been a manager, assistant manager and worked for some of the best clubs in the country – he is an absolute top operator. “His team epitomised that on Tuesday against arguably one of the best teams in the league and one of the most formidable places to go with the goals they scored and the clean sheet they kept against a Bury team that score goals by the bucketload. “So we will respect Cambridge like we respect every single opponent and put the same work into them as we did against Exeter. Mansfield is a much happier camp this week after ending a four-game winless streak with a sparkling 4-1 win at rivals Exeter City last Saturday. “It’s a long way home from Exeter and when you get beaten it doubles the journey time as you are analysing, evaluating and look at every aspect of what went wrong and right,” he said. “When you win in such a fashion and there is a bounce and feelgood factor in the squad on a five hour journey it makes a big difference. “We started the week with a bounce and you could feel the tempo on the training ground. The lads want to get out there. “The lads have worked hard all season. They will get games wrong. They will get things wrong. “But I suppose it’s how I react and how my staff react that sets the tone and the environment.